Stonington perfectly captures the confident individuality of Denyse’s Yankee heritage, and evokes a beautiful preppy/bohemian vibe with cool understatement. Think 70's rock stars, Ali McGraw, patchwork everything, tiered flounces, lots of prints mixed together, big floppy hats, wide-legged pants, and scarves galore. Ten coordinating patterns in three salty colorways (Lobster, Twist, and Dungaree) offer a range of hues and texture, with plenty of hi/lo volume to combine and contrast. Practical and fanciful, Stonington is your go-to collection – the possibilities are endless! 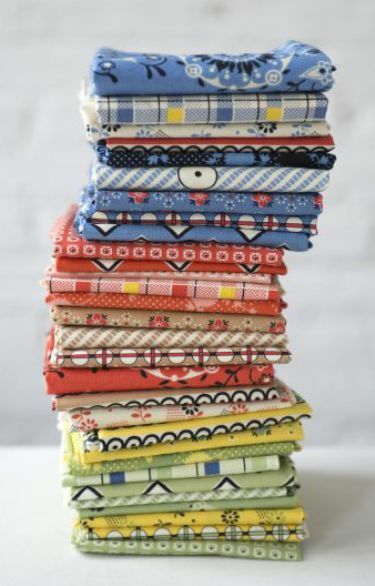 Shipping August 2016 From FreeSpirit Fabric. We love earlier DSQ patterns and book projects made in Stonington!